WARNING: Haven’t seen the movie? Spoilers below! 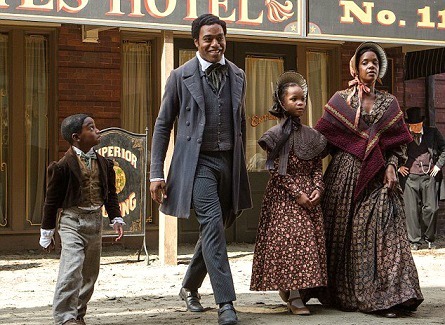 Pictured: Solomon Northup (Chiwetel Ejiofor) with his family in New York. The story beings in the year 1841 in Saratoga, New York where family man Solomon Northup is enjoying his family life and working as a foreman of river transportation and as a talented violinist. After his wife and two children leave their home to go on an annual work trip where his wife gets paid good money as a cook, Solomon is tempted and accepts a job proposal by two strangers that are part of a band to come play with them in Washington. The two strangers eventually set him up to be captured and sold into slavery. Years into his journey, Solomon is transferred to a cotton plantation where the story’s heroine is revealed in a young beautiful slave woman named “Patsey” (Lupita Nyong’o) who is also the desire of plantation owner “Master Epps” (Michael Fassbender). Pictured: Patsey (Lupita Nyong’o) makes corn husk dolls. After the screening, actress Lupita Nyong’o from Kenya, was introduced as this being her first starring role in a major film. Nyong’o was discovered just months before graduating from Yale School of Drama. The role required her to audition in three different states. She was invited to Louisiana to audition for Steve McQueen. The movie shot in the summer. So it worked out perfect around her school, even if she had not been graduating. The scene that she had to audition with was when Patsy asked Solomon to kill her, and the very dramatic and hard to watch “soap scene.” This scene was possibly the longest scene in the film and it included most of the main actors. Patsy was punished for running off to get soap for herself. London actor Chiwetel Ejiofor, who excellently played Solomon with much passion, said he met Steve McQueen after “Hunger”. Steve called him up and asked if he’d like to do “12 Years A Slave”. He said he never heard of Solomon Northup until then. “I understood the weight and responsibility of the subject.” It took him a while to connect with Solomon which he did through the book. He told Steve he needed a bit of time before he could accept the role. He also said that Steve thought that he was turning down the role. Lupita said she visited “The National Great Blacks in Wax Museum”. The first thing that she said she saw at the museum when she walked in was 500 lbs of cotton. She said it was taller than her. In the film and book, Patsy has a reputation for picking 500 lbs of cotton every day. Master Epps takes much pride in it and calls her his “Queen” of the plantation. 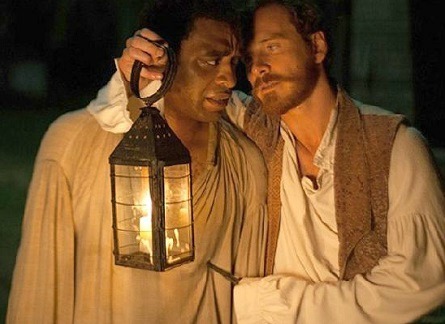 Pictured (l-r): Chiwetel Ejiofor (Solomon), Michael Fassbender (Epps). She said “it was such a fantastic experience to work with Michael Fassbender.” After her first rehearsal with him, he told her “You are my peer,” she choked-up as she told the audience. Because of the heavy subject material and although the fact that though Epps prized Patsy’s great cotton-picking ability and sexually desired her, she was not protected from his physical abuse, and at times she even suffered the worst of it. Perhaps from his guilt of hatred on himself for wanting her so much. Lupita said that her and Fassbender had an unspoken ritual where they started every scene with a look in the eyes and ended each scene with a hug. 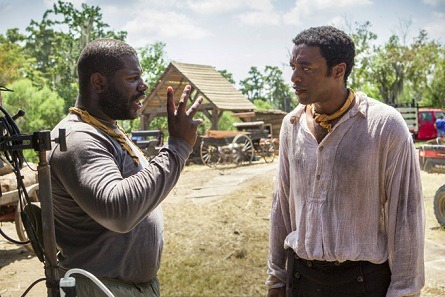 Chiwetel said the movie was shot in thirty-five days in New Orleans and “there was a real momentum for everything.” He said that there were not a whole lot of takes done. He said McQueen, like him, believe in getting the most in the first take. Lupita said it took makeup artists four hours to do her scars. She said the day before the “soap scene” it said on her call sheet that it would take six hours. So, she told the makeup woman that she would keep them on the day prior. Lupita said she slept even less that night and that they hurt which caused her great discomfort. Suddenly, she came to the sad realization that for her, the discomfort was temporary. But, for Patsey it was not. So, she did not complain. Lupita also noted the corn husks and thought of creating dolls from them. She suggested it to Steve, and he put it in the film. They researched it and found that indeed it was a factual act to make dolls from corn husks in that time. Lupita said she did not watch the film right away and not only until she had to talk about the movie and promote it did she watch it with her friend and representation. She said she cried from the beginning to end, as well as after. Chiwetel said that Solomon was in a constant struggle with his freedom and his mind. Trying to keep his sanity and the thought that he would arrive back to his family. He said that a lot of times Solomon is by himself, but realizes that he needs to join in the community in order to survive. Chiwetel also said that Steve’s approach was to create a real family on the set. He said it was the most extraordinary experience not only as an actor, but also of his life. “12 Years A Slave” also stars Sarah Paulson as “Mistress Epps”, Alfre Woodard as “Mistress Shaw”, Benedict Cumberbatch as “Ford”, Kelsey Scott as “Anne Northup”, Quvenzhane Wallis as “Margaret Northup” and Brad Pitt as “Bass”, the man who wrote the letter that got Solomon Northup rescued from the plantation where he re-entered his free life. In 1853, Soloman Northup’s written real-life account “12 Years A Slave,” was published. Chiwetel said not much was changed from the book. The real-life Solomon Northup later brought all of the guilty men to trail, though none of them were successfully brought to justice. Northup died just a few years later and not much is known about the circumstances of his death.